Children’s pastors and ministry leaders consistently point to recruiting and retaining dedicated volunteers as their number-one challenge. How can they keep volunteer workers engaged in ministry that will change peoples’ lives? Larry Fowler, Director of Program and Training for Awana Clubs International, believes that there are seven biblical principles, drawn from the book of Nehemiah, that will help pastors and leaders more effectively motivate and manage volunteers. 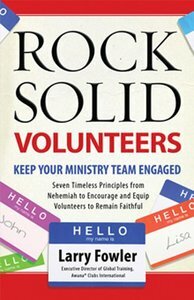 Rock-Solid Volunteers looks at the obstacles Nehemiah and his volunteer workers faced - fatigue, weakness, loss of vision, peer pressure and opposition, just for starters!—and examines the seven steps Nehemiah took to lead his volunteers to success. Pastors and ministry leaders will be equipped to attract, inspire and keep talented, committed volunteers, no matter the challenge!